BOOM! Studios and WWE are excited to announce the WWE SURVIVOR SERIES 2017 SPECIAL, arriving in stores November of 2017 and featuring some of the biggest WWE Superstars in history! With stories by writers Kevin Panetta (Zodiac Starforce), Ryan Ferrier (Kong on the Planet of the Apes), and Julian May (Saga of Pilocene Exile), and featuring art from Brooklyn Allen (Lumberjanes), Kendall Goode (The Doorman), and Kelly Williams (The Cabinet), this special celebrates one of the most beloved annual pop culture events with untold stories from the world of sports entertainment. WWE SURVIVOR SERIES 2017 SPECIAL is an oversized, stand-alone issue that features several short stories tied to key matches from the storied history of WWE, including the Brock Lesnar and Goldberg showdown in 2016 that was 12 years in the making; the 2016 Team Raw vs. Team Smackdown Women’s Elimination match; and perhaps the most controversial (and infamous) match in WWE history—1997’s Montreal Screwjob. 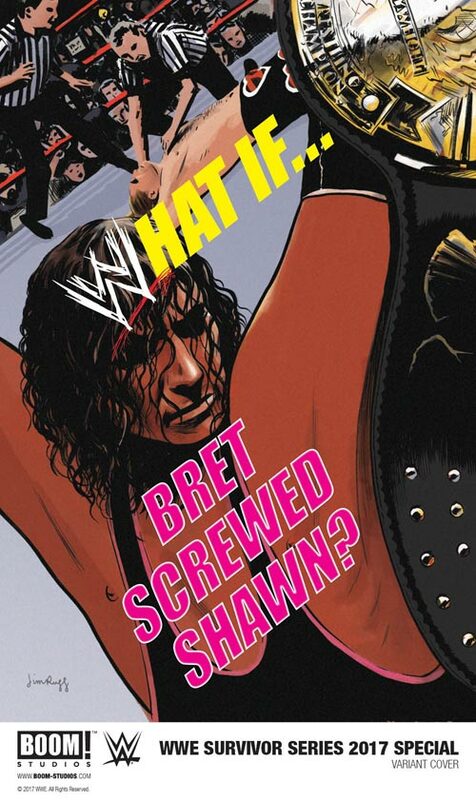 The main cover for WWE SURVIVOR SERIES 2017 SPECIAL is illustrated by Rahzzah (WWE), with a special “Montreal Screwjob” WWE What If? variant cover by Jim Rugg (Street Angel). WATCH: It is Morphin Time for Power Rangers: Shattered Grid! Can They Citizen Arrest ROBOCOP? BOOM! Studios announces ROCKO’S MODERN LIFE comics!